July 18, 2017 – What’s the Answer to a Sustainable Future? We Are. July 10, 2017 – Living Sustainably: Everyone is part of a watershed – celebrate yours! July 10, 2017 – Can animals suffer from PTSD? When designing a building, most architects consider the functions of the building to determine the building structure and materials. However, the WELL Building Standard rating system v1.0, launched in 2014, has increased the consideration of human health in design and construction strategies. Seven years of development helped formulate seven wellness concepts included in the WELL Building Standard. A WELL building certification must demonstrate specific thresholds of compliance within each of those concepts: air, water, nourishment, light, fitness, comfort and mind. The International Building Institute, which administers the voluntary WELL standard, is committed to balancing occupant health benefits with profitability. Each concept in the WELL Building Standard has many features that focus on specific aspects of occupant health, comfort or knowledge. It also identifies specific aspects of human health it will impact. As an example, consider the following about the first feature, Air Quality Standards. Air pollution contributes to 50,000 annual premature deaths in the United States and about 7 million annual premature deaths worldwide. Indoor air quality is particularly important since the average person spends more than 90 percent of their time indoors. Indoor air quality can suffer from a variety of sources, including material off-gassing, decreased outdoor air ventilation, indoor combustion sources, and surfaces that can accumulate airborne germs. These conditions can contribute to negative health effects such as asthma, upper respiratory illnesses, allergies, headaches, and decreased work productivity. The U.S. Environmental Protection Agency regulates indoor pollutant exposure and pollutant concentrations with the National Ambient Air Quality Standards. These standards limit exposure to six major pollutants: carbon monoxide, lead, nitrogen dioxide, ozone, particular matter, and sulfur dioxide. The WELL Building Standard incorporates these U.S. standards, as well as the World Health Organization requirements. Those compliance requirements also limit exposure levels for formaldehyde and radon. A radon kit can be purchased for testing and then mailed in to obtain free results. Formaldehyde, a carcinogenic, can be released into the interior spaces from adhesives in new materials, called off-gassing. There are three easy ways to remove indoor air pollutants.  Increase outdoor ventilation by opening windows and/or doors as well as turning on exhaust fans.  Purchase High Efficiency Particulate Air (HEPA) filters that have different diameters of fibers that can retain smaller airborne pollutants.  Avoid materials and products that might contain chemicals or produce chemicals such as those for which the National Ambient Air Quality Standards recommends limited exposure. 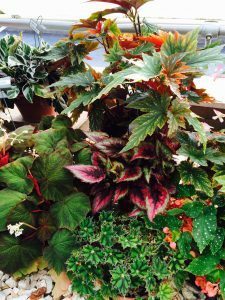 Another option is that certain plants can absorb chemicals. The gerber daisy and chrysanthemums are most effective at removing formaldehyde. Spider plants are best for removing carbon monoxide. Good indoor air quality is important for everyone’s health. It is helps occupants live longer, feel better and be more productive.  Morna Hallsaxton has degrees in interior design and environmental design and operates EcoCreative Design, an interior design business with an emphasis on healthy environments. Her work has included reviewing LEED projects, auditing BIFMA Furniture Sustainability Standard compliance and certifying products for environmental volatile organic compound emissions. Healthy air.jpg Growing indoor plants helps make indoor healthier, with some plants known to reduce certain toxins. June 30, 3017 – Michigan League of Conservation Voters and the Michigan Environmental Council released a report recently detailing the implications of the proposed federal and state budget cuts for our Great Lakes, drinking water and natural resources. June 19, 2017 – Thousands of wildebeests die in a river each year. Here’s why that’s a good thing. June 6, 2017 – The Michigan Restaurant Association (MRA) has partnered with the Michigan Department of Agriculture and Rural Development and Michigan Ag Council to raise awareness of the economic impact of restaurants using Michigan manufactured products. This is a group partnership that will be working together to recognize restaurants with the 2017 Michigan GROWN, Michigan GREAT Restaurant Award. Students are naturally curious about the world around them. So why not let that curiosity drive their learning? Simple and compact air quality monitors developed by resident Don Triezenberg are doing just that through a program managed by ExploreHope, Hope College’s educational outreach center. 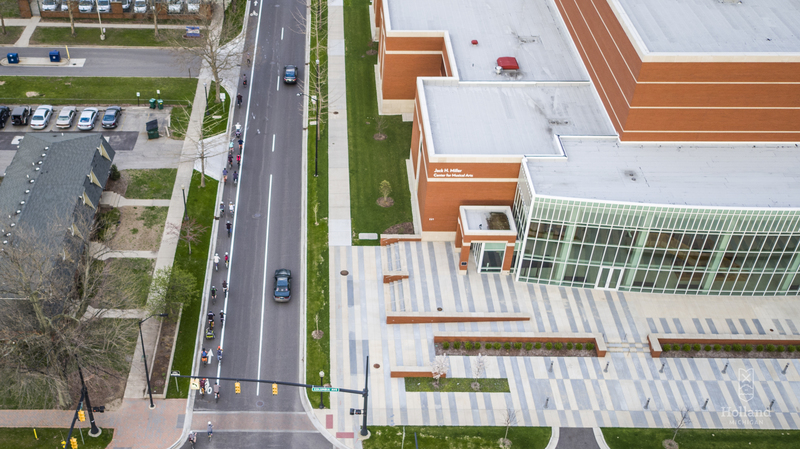 Partnership with the Holland-Hope College Sustainability Institute expands the community relationship of the project. The simple air quality monitors are equipped with carbon dioxide and particulate matter sensors. 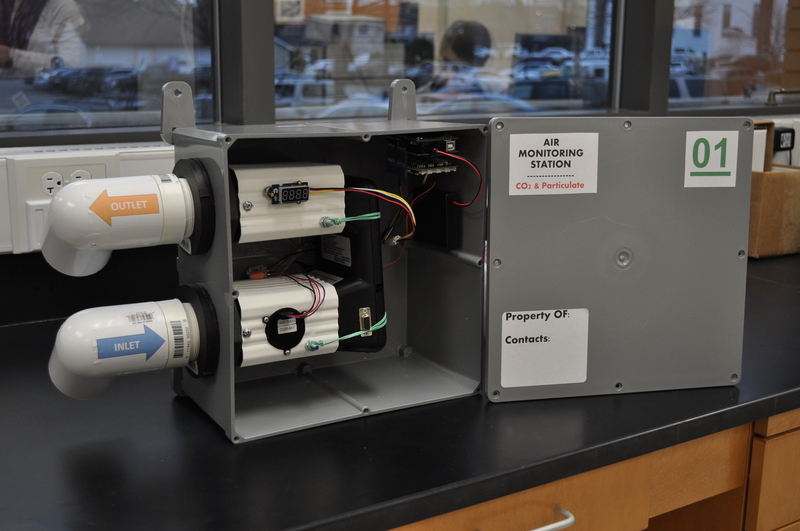 Students can use them to test the air in and around their homes and schools. Through that process, the monitors have introduced science lessons to more than 300 middle and high school students in West Michigan. 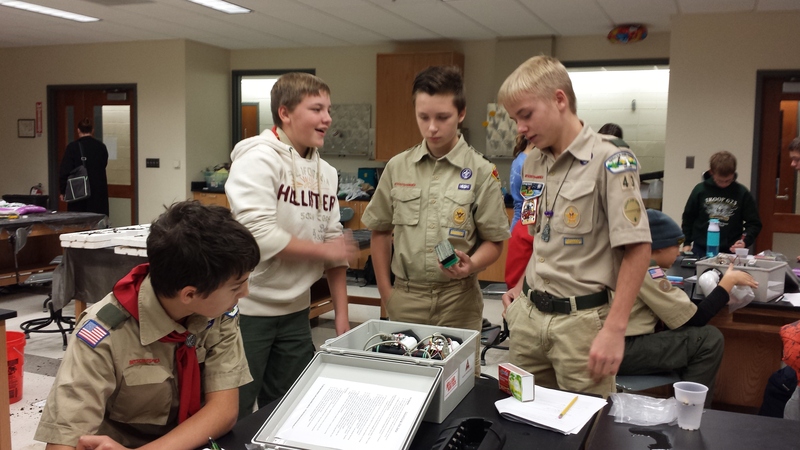 Students are challenged to first discover how the monitors work through experimentation. Then, with guidance from their teachers, they design and carry out their own experiments. This student-directed learning sparks the interest of the students and allows the teacher to engage the students in a directed discussion of the related science. While the data from these monitors are not yet calibrated to a high enough level to publicize as community air quality assessments, the findings provide powerful examples to illustrate how environmental conditions can change based on a variety of conditions. Students are investigating questions related to changes in air quality in different sections of their homes, or how the air composition changes as all the students show up for school in the morning, or the effect of humidity on air quality. Teachers are observing that students in a range of classes benefit from use of the monitors, with implementation in chemistry, math, biology and environmental science classes as examples. 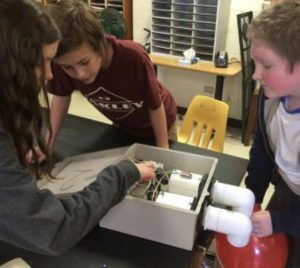 Middle school students in Grand Haven even started to challenge their teacher to learn how the weather and other conditions affected their data. This week the monitors are at West Ottawa High School’s AP calculus classroom. These students have just completed their AP tests, and their teacher wanted to keep them engaged in the final weeks of school. Not only will the students be exploring real-time data collection, designing experiments and data analysis, they also will see the topics covered in their classroom in real world applications. The monitors won’t sit idle over the summer, either. They will be used in the Hope College Summer Science Camp program managed by ExploreHope. Middle school students will explore the impact of energy generation, and high school students will explore experimental design in a week-long camp. More information on these programs is found at hope.edu/explore. Teachers interested in hosting the monitors in their classroom next year should reach out to explore@hope.edu. Additional community partners and supporters are welcome. Funding for new monitors is needed to reach the growing classroom demand. What’s next? Only the students can tell us that.  Susan Ipri Brown is director of ExploreHope and instructor of engineering at Hope College. Boy scouts2.jpg The air quality monitors are used during a Boy Scout Environmental Science Merit Badge Day at Hope College. students.jpg Students examine the workings of the air quality monitors they get to use for testing and experiments. Monitor.jpg – These simple but effective devices monitor carbon dioxide and particles in the air, letting students devise and test their own experiments. May 18, 2017 – The Michigan League of Conservation Voter’s Governor’s Report Card offers resource to assess how Governor Snyder performed over the last two years. May 16, 2017 – WALK THIS WAY TO CHALLENGE BORDERS. The project has much to teach you about those whose lives have experienced disruption and disorder due to immigration, climate change, the refugee crisis and mass incarceration. And the disciplines of art and English and science and psychology and communication all converged to do so, crossing interdisciplinary boundaries in order to challenge you about the ways you view borders — domestic or international — and the people who are affected by them. It’s finally spring! This time of year always warms my heart. The flowers and trees begin to blossom, the days gradually get longer and I notice myself and our neighbors venturing out more often from our homes. It’s incredibly refreshing to finally be able to soak up some warm rays. Every spring I challenge myself to be more active, spend more time outside and ride my bike to work. And a great place to start my healthier and more sustainable commute is during the annual Holland/Zeeland Green Commute Week, now in its tenth year. 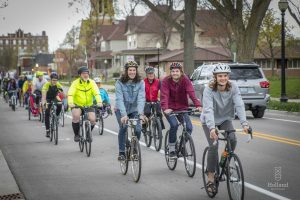 The week-long commute challenge takes place May 14-20. It promotes walking, biking, carpooling, riding the bus and any other alternative transportation. During the week, teams from businesses track their Green Commute miles online to compete for bragging rights and a trophy. Getting the entire workplace involved is a wonderful way promote healthy living and a healthy planet, but also the friendly competition can be a great team-building exercise. Individual commuters not affiliated with a business can also submit their miles on the Macatawa Area Coordinating Council’s website to contribute to the overall total. At the end of the week, the Green Commute miles are totaled to calculate air quality and financial benefits to the community. An added perk for Green Commute Week participants are Recharging Stations. These are local businesses giving discounts on things like coffee and food purchases, bike tune-ups, and free rides on MAX Transit’s fixed route service. (Find an interactive map showing the stations on the Green Commute web page.) Also this year, the Herrick District Library on River Avenue will have a photo-booth set up for anyone who green commutes. To be eligible for discounts, participants must wear a Green Commute pin, available at the MACC office on Douglas Avenue, from any local bike shop or through an employer that is pre-registered. To sign up your place of work or get more information about the commute challenge, call the MACC at (616)395-2688 or email culstad@the-macc.org.  Carolyn Ulstad is program assistant at the Macatawa Area Coordinating Council. Sunday: Commute kickoff; consider biking downtown, or walk or carpool to church. Monday: Bike Rodeo at Lakewood Elementary, 5 to 7 p.m. Bike Holland, 7 to 8 p.m. Casual ride, all skill levels. Meet at Centennial Park. Wear helmet. April 29, 2017 – Can a tiny house play a role in helping the homeless? 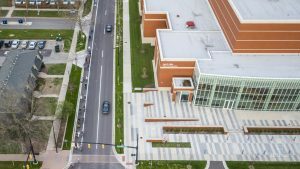 April 10, 2017 – STUDENTS TO PRESENT CREATIVE AND RESEARCH PROJECTS ON APRIL 21 Original research by students on topics ranging from the historical roots of the Black Lives Matter movement, to monitoring of the Lake Macatawa watershed, to changes in political trust in the United States will be highlighted during the annual Celebration of Undergraduate Research and Creative Performance at Hope College on Friday, April 21, from 2:30 p.m. to 5 p.m. at the Richard and Helen DeVos Fieldhouse. April 4, 2017 – MICHIGAN SPACE GRANT CONSORTIUM SUPPORTS SEVERAL PROJECTS Several Hope College projects have received grants from the Michigan Space Grant Consortium (MSGC). April 4, 2017 – Subscription boxes OK for the Earth? January 11, 2017 – This bumble bee was everywhere. Now it’s on the endangered species list. January 4, 2017 – As from 1 January 2017 100% of Dutch trains are powered by wind energy. The Dutch railways company NS is the world’s first railway company that gets 100% of its energy from wind turbines. January 1, 2017 – 2016 Holland Annual Report What a year it was! Expanded snowmelt, LED lights, Home Energy Retrofit Program, Record High Voter Registrations and much more. Take a look inside Holland’s 2016 Annual Report.